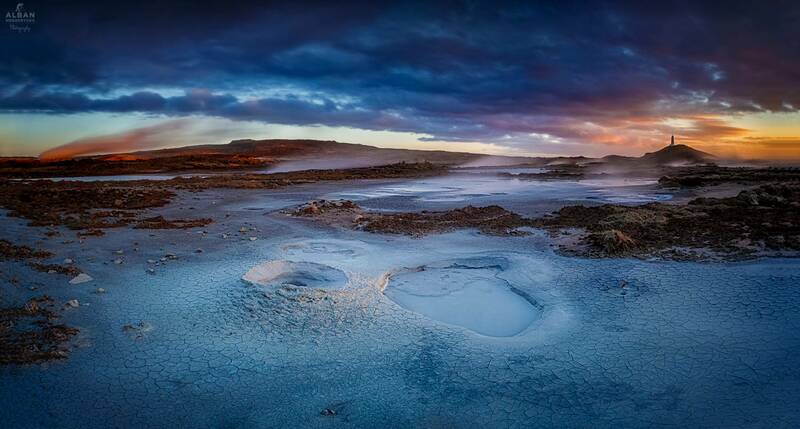 This mini-Iceland trip is the perfect way to experience all the magic that the land of fire and ice has to offer. It will take you on exhilarating adventures, through a plethora of incredible landscapes that range from pristine snow-carpeted glaciers to sapphire blue ravines, bubbling hot springs and much, much more. If you really want to make the most out of your trip, then we recommend arriving early and leaving late. This magnificent self-drive tour will take you through some of the most magical places that Iceland has to offer. It puts you in total control of your holiday in the land of fire and ice, allowing you to enjoy all the traditional sights or veer off the beaten track and visit some more obscure places. There is a myriad of majestic landscapes, from stunning waterfalls to beautiful mountains and much, much more. We provide you with everything that you need, including a detailed plan, some insider tips on where to go and what to see and information on all the wonderful sights that you will see. 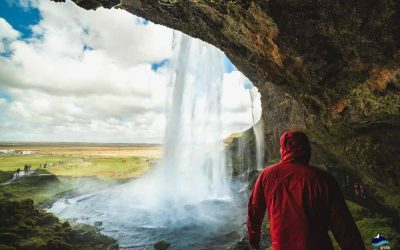 On the tour you will receive a detailed itinerary, map and self-drive handbook, it has been tailor-made to give visitors the very best possible experience, of Iceland’s legendary South Coast. Day one begins, whenever your flight lands and you collect your rental car from one of our dedicated pick-up points, however, we recommend arriving as early as possible, so you can maximize your time in Reykjanes. 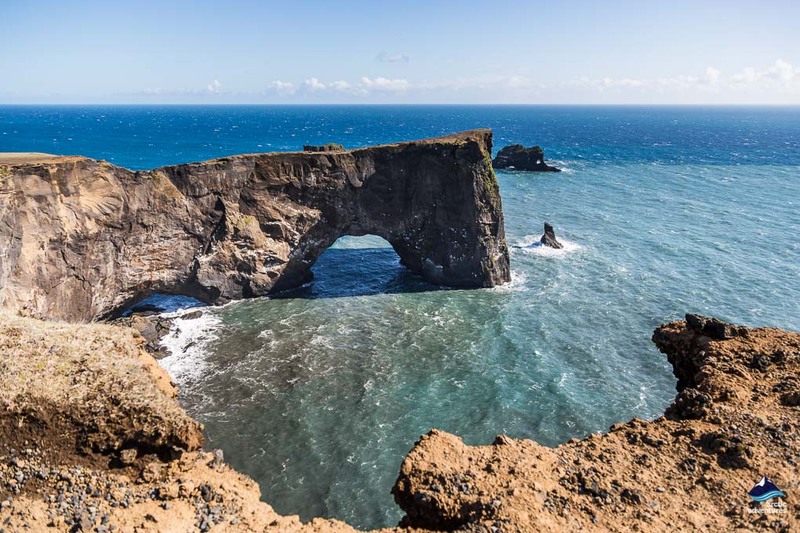 Reykjanes is often overlooked by visitors to Iceland, because it is the area that they first see, however, it is a UNESCO World Heritage Geopark crammed full of incredible sights. Reykjanes is renowned for its rugged scenery, which gives it an otherworldly quality that visitors are bound to appreciate. Foremost of these is the iconic Keilir, a distinctive cone-shaped mountain, which has come to be totemic of the entire area. Along with moss-covered lava fields, cavernous volcanic craters, charming villages and a plethora of other things. 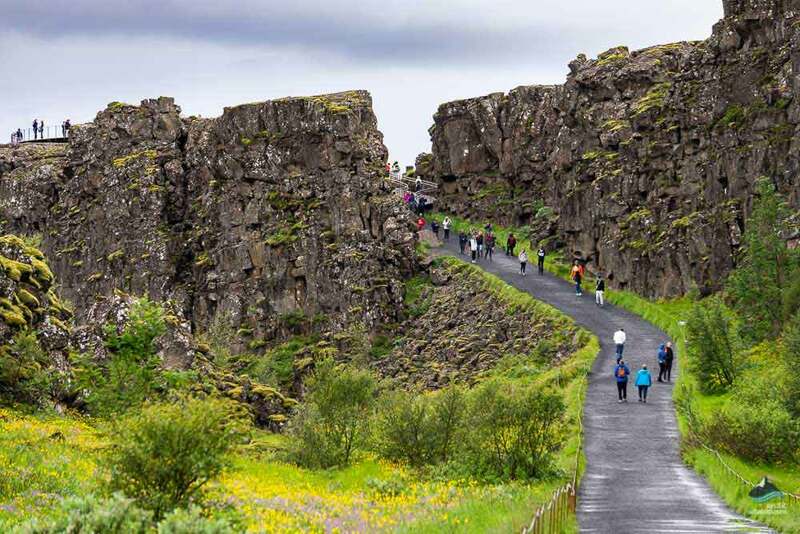 The peninsula is situated between the European and North American tectonic plates, meaning that visitors can literally walk between them, most famously at the aptly named bridge between the continents. 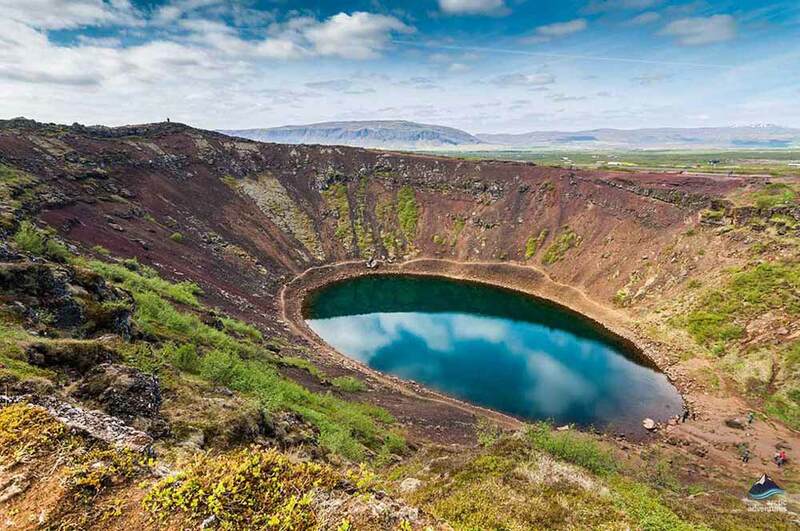 Another fascinating sight is Lake Kleifarvatn, a crater lake which stretches down more than 100 meters in places, making it the source of many myths and legends, including one about a Loch Ness-like creature that lives somewhere in its depths. Another interesting stop off point is the Gunnuhver Hot Springs, where bubbling mud and water are thrown into the air and a vengeful ghost supposedly torments residents of the surrounding area. 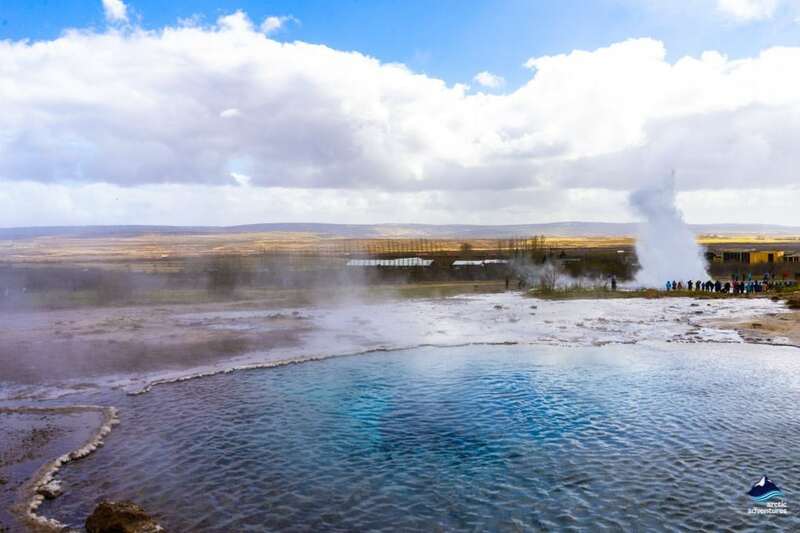 There is the powerful geothermal power station that pumps hot water out from the ground and generates electricity for the nearby towns in an environmentally friendly way, alongside the legendary Blue Lagoon lake, renowned for being the best natural spa in the world. The Blue Lagoon is a luxurious spa, which has been rated as one of the ’25 wonders of the World’ by National Geographic. It is famous for its milky-turquoise waters that are pumped from more than 2,000 meters beneath the Earth’s surface and arrives to the lake at a perfect 38-40 degrees. Various minerals and algae reside in the lagoon’s water, giving it a nutrient-rich volcanic quality that has been used to heal skin conditions for many centuries. An incredible natural spa, its geothermal waters and stunning surroundings make it the perfect place to rejuvenate yourself before your next adventure. 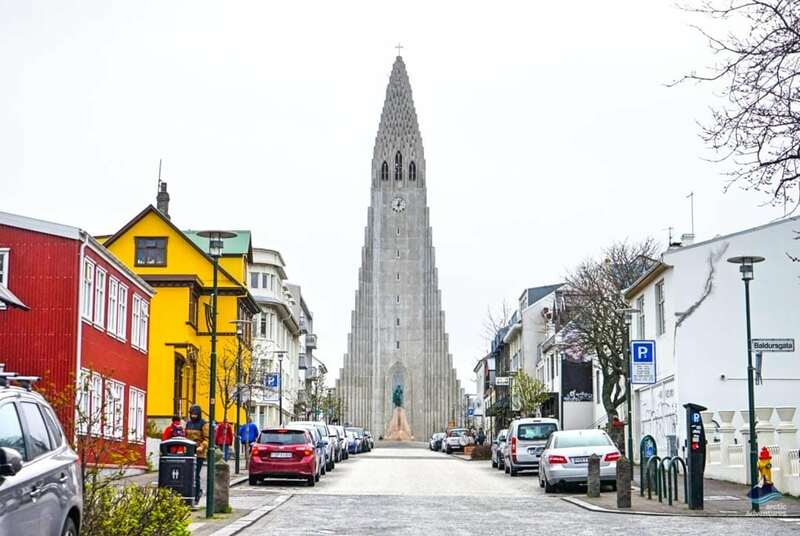 Once you have seen all the magical sights that Reykjanes has to offer, your accommodation for the next three nights will be booked by us in the Reykjavik Capital Region, the perfect place to visit a delicious Icelandic restaurant or spend an evening in a trendy pub. 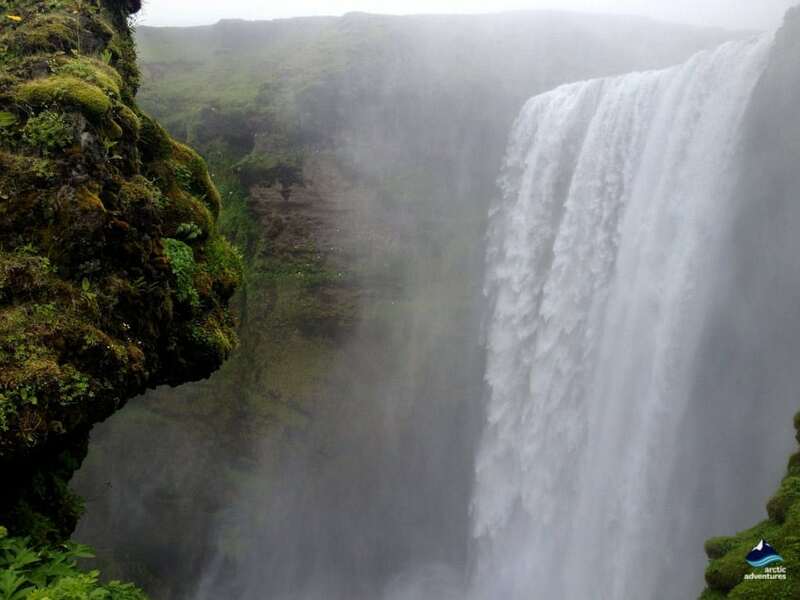 Seljalandsfoss and Gljúfrabúi waterfalls. Skógafoss waterfall. Dyrhólaey cliffs. Reynisfjara black sand beach. Vík village. 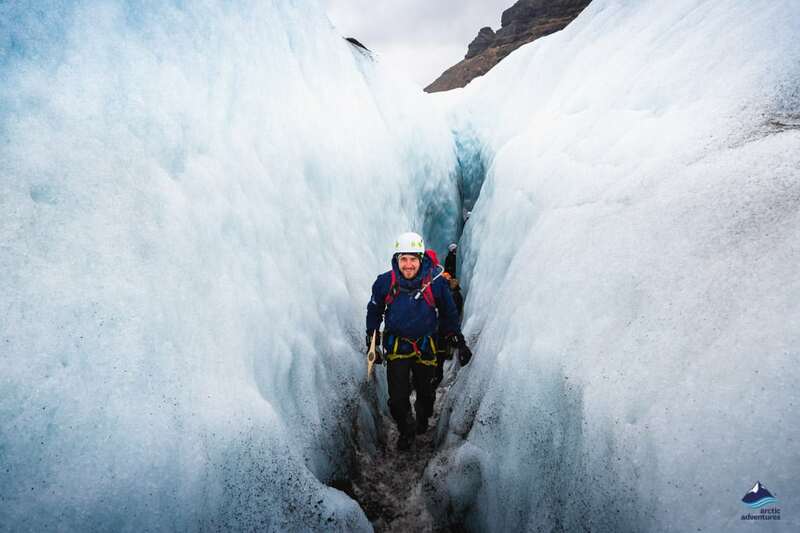 Sólheimajökull glacier and a glacier hike. 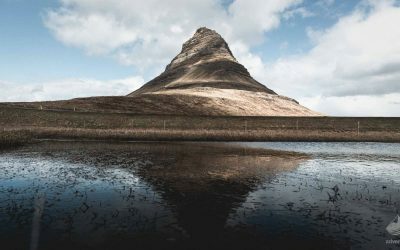 Your second day will take you to Iceland’s magnificent south coast, famous for a broad range of incredible sights that have made it one of the most popular destinations in Iceland. 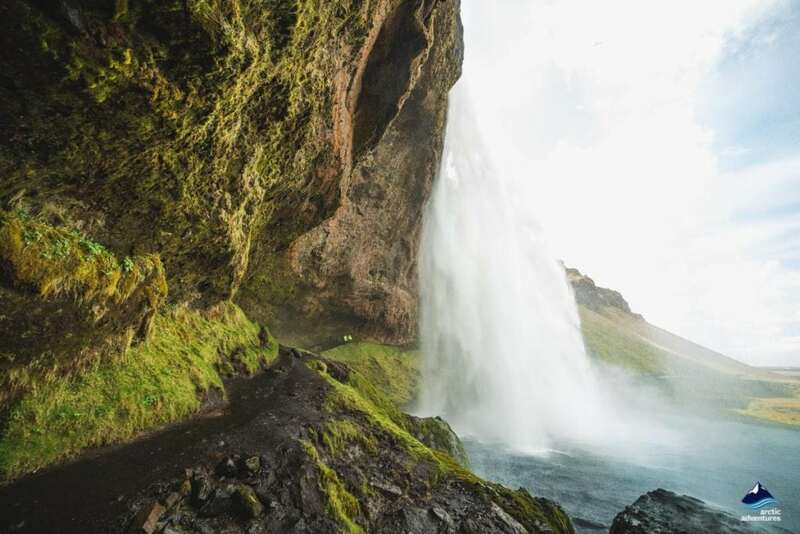 As you leave Reykjavik, your first stop will be the majestic Seljalandsfoss waterfall, where a cascading stream of water vaults down 60 meters into a valley below. 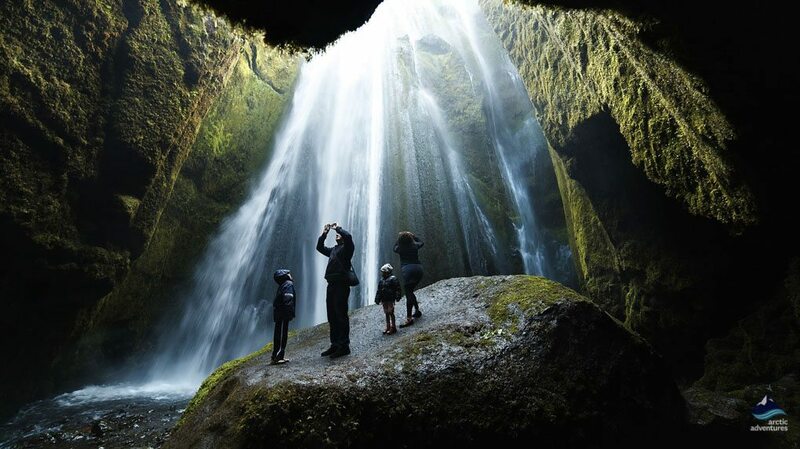 There is a hidden cave behind Seljalandsfoss itself, allowing visitors to walk behind the waterfall and see it from a totally different perspective. 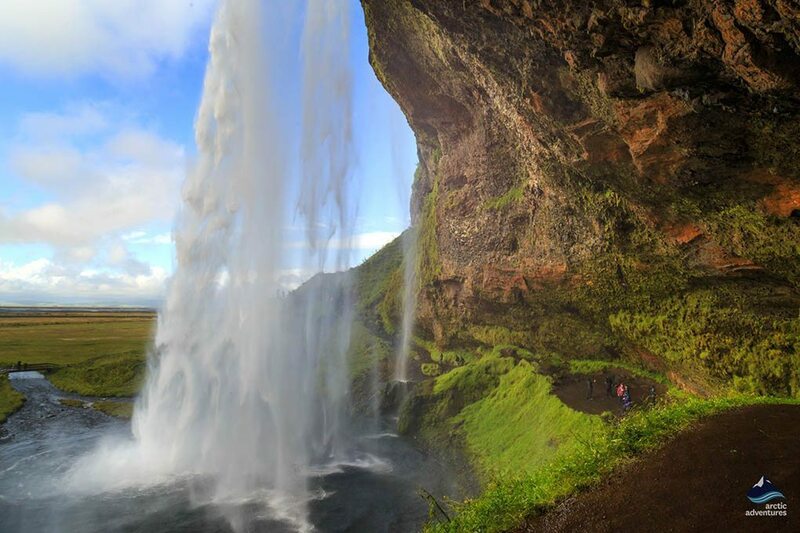 Near to Seljalandsfoss, is the gorgeous, Gljúfrabúi Waterfall that is nicknamed the ‘secret waterfall’. It is hidden in a narrow canyon, with moss-covered walls, where icy blue water rushes down the cliff-face into the abyss below. A stunning place, which lies well off-the-beaten-track, though visitors should be ready to get a little wet when visiting this gorgeous location. Your drive will take you past the notorious Eyjafjallajökull volcano, which made itself famous in 2010 when its six-day-long eruption grounded the majority of Europe’s air fleet. It is now covered by a massive 100-kilometer icecap that covers its summit. A little further down the road is the Skogafoss Waterfall, where a gushing stream of melted glacial waters falls into a pool below. There is a winding path that meanders around the hill and allows visitors to climb to the summit, rewarding you with spectacular vistas of the surrounding area. Along this path are two fascinating rock formations, nicknamed the trolls, which local legend holds are two petrified trolls that were turned to stone by the sun. Once you have arrived at the coast, you will be greeted by a series of magnificent jet-black volcanic beaches and fascinating rock formations, just waiting to be explored. 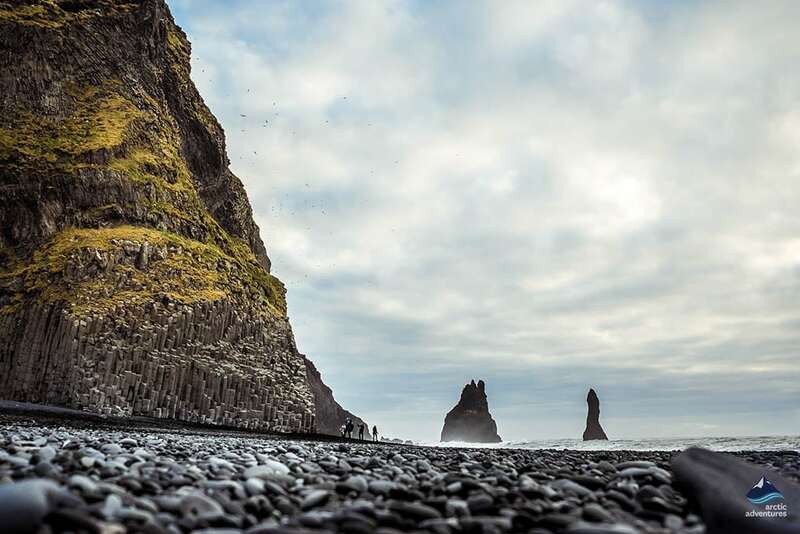 The route will take you to the Dyrhólaey cliffs and the Reynisfjara Black Sand Beach, which are situated just a couple of miles from each other. With a never-ending stretch of charred volcanic sand lying between them. The stunning contrast as the white-crested waves lap up against the jet-black beach is a sight to behold, which is only enhanced by the incredible basalt cliffs that lie behind them. These column-shaped stone structures are completely unique and look a bit like the tubes of a giant organ. The cliffs are also home to a plethora of nesting marine birds, including adorable Atlantic Puffins and a host more. This takes you to the picturesque village of Vik, the perfect place to stop and enjoy a view of the beautiful rock formations while enjoying a spot of lunch. 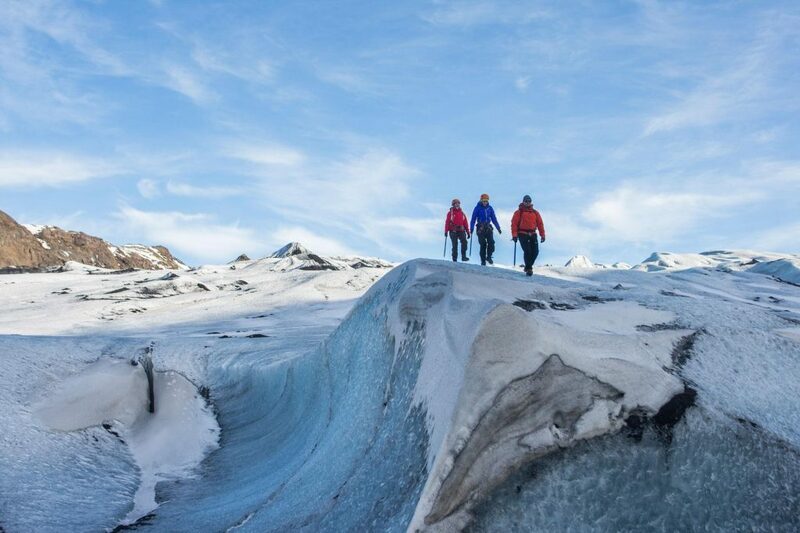 Take a hike.. on a Glacier! The iconic Mýrdalsjökull Glacier is a colossal 600 square kilometer ice cap that has become totemic for Iceland as a whole. It is riddled with several smaller glacial tongues, which fall out of the main body of ice. Once you have arrived, you will meet our friendly guide who will ensure that you have all the equipment that you need and give you a brief safety talk. Then you will travel out onto the glacier itself, to explore its crevasse-ridden icy surface, in all of its stunning glory. 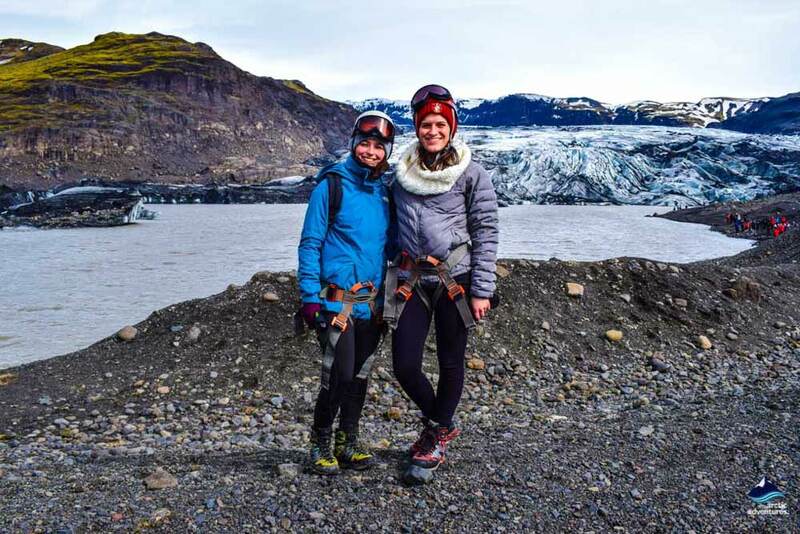 Hiking on a glacier is often a highlight of visitors’ entire Iceland trip and you are bound to form memories that will last you a lifetime. Then, tired and happy you will return to Reykjavik for the evening after a fun-filled day full of adventure. Þingvellir National Park. 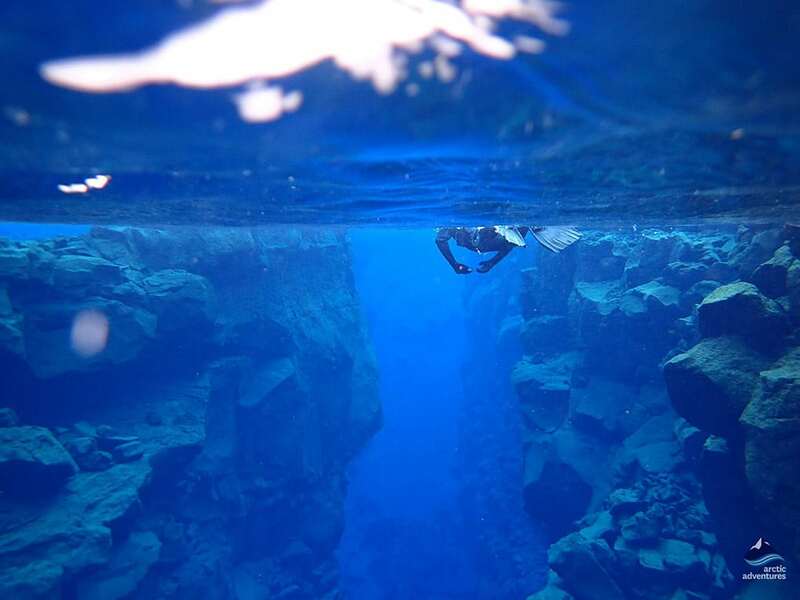 Snorkeling adventure in the Silfra fissure. Geysir geothermal area. Gullfoss waterfall. Faxi waterfall. Kerið volcanic crater. 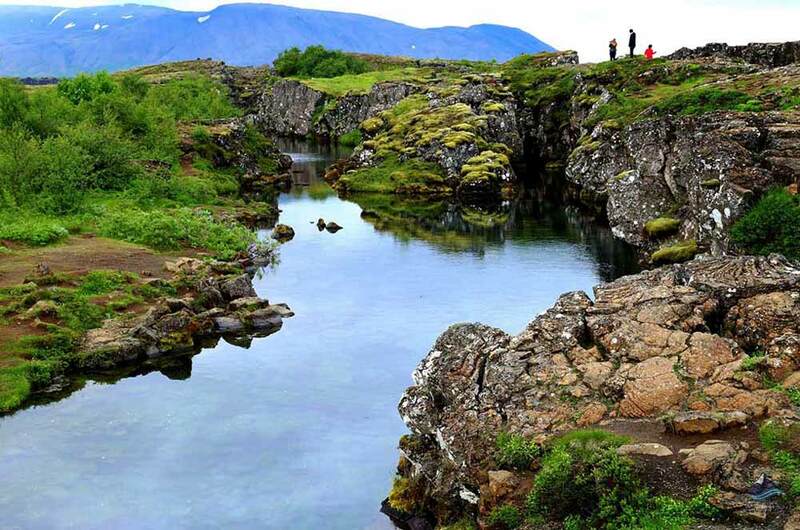 Day three will take you to the famous Golden Circle Route, one of Iceland’s most popular tourist destinations. It is renowned for a variety of incredible sights, including stunning waterfalls, seething geysers, and magnificent rock formations. The first stop is Thingvellir National Park, a UNESCO World Heritage Site, which is both steeped in history and known for having some of the most unique geology that can be found anywhere. It is home to Althingi, where Iceland’s parliament first met in 930 AD, making it one of the longest continuously running Democratic institutions in the world. 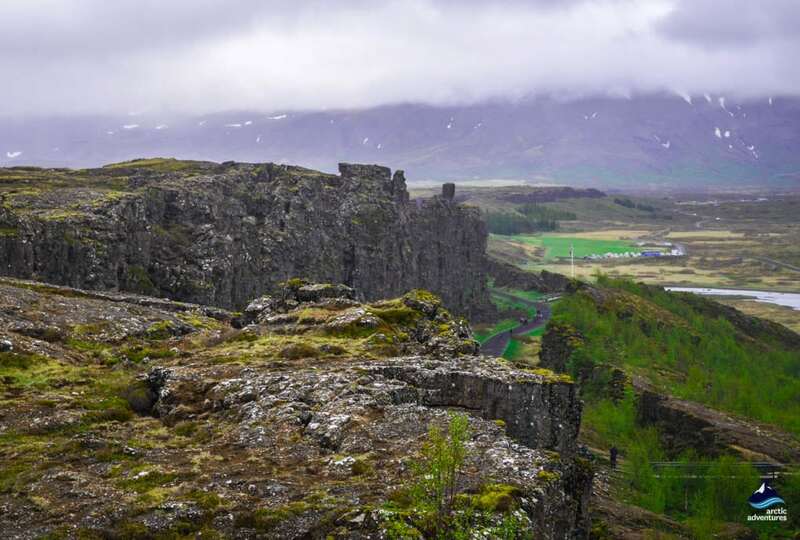 Thingvellir also straddles the Mid-Atlantic-Ridge, meaning that it bisects the continents of Europe and North America, and visitors will literally be able to gaze across the gap between the tectonic plates that define the continents. 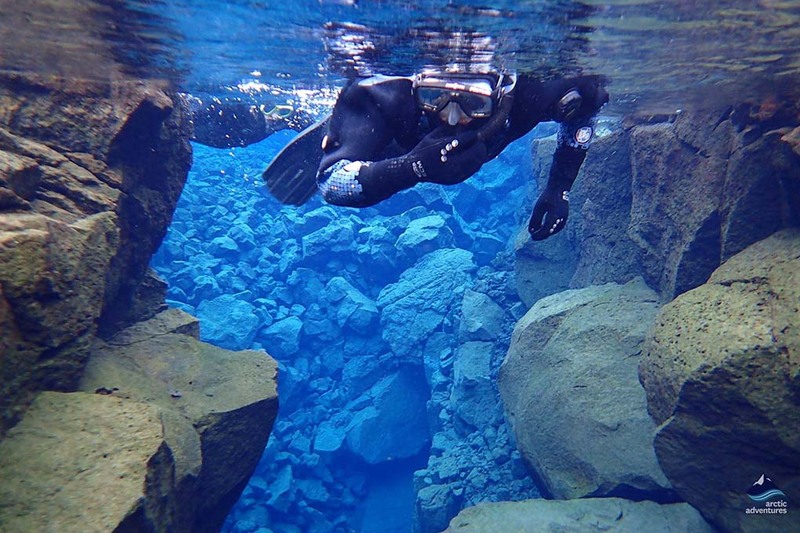 The Silfra Fissure is a deep ravine that is located between the North American and European tectonic plates, meaning that when you snorkel there, you will literally swimming between two continents! 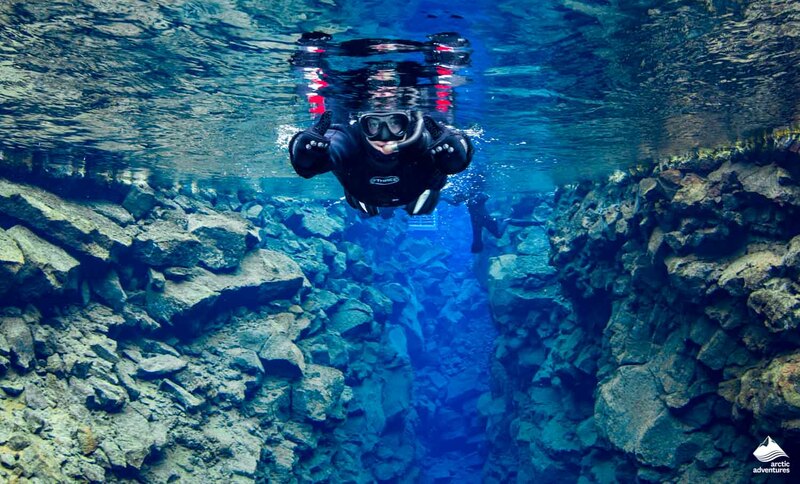 This coupled with the fact that it is filled with crystal clear glacial water, which allows visitors to see more than 100 meters, has meant that it is rated as one of the top 10 diving sites in the world. Snorkeling in its turquoise waters is an incredible experience that will remain with you for the rest of your life. The opportunity to explore this sapphire wonderland crammed with underwater treasures should not be missed. Our experienced guides will provide you with all the gear that you need and take you into this alien blue world, dotted with emerald plants and spectacular rock formations. The penultimate stop is the famous Geysir area, which has come to symbolize Iceland as a whole. It is home to several iconic geysers, including the now dormant Great Geysir, which gives all geysers their English name, alongside its younger brother Strokkur, a bubbling, seething hot spring that throws molten streams of water up to 25 meters into the air, every 4-8 minutes. 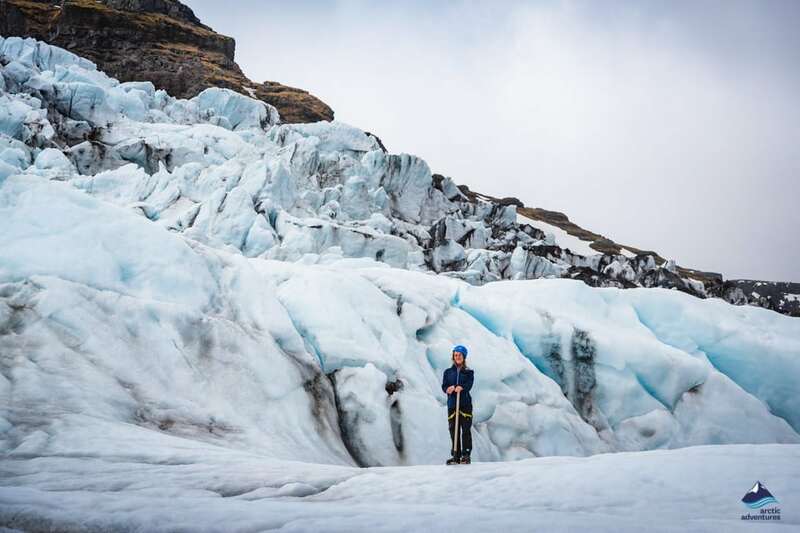 It is the perfect way to gain a new insight into just how powerful nature can be and something that everybody should see when they visit the land of fire and ice. 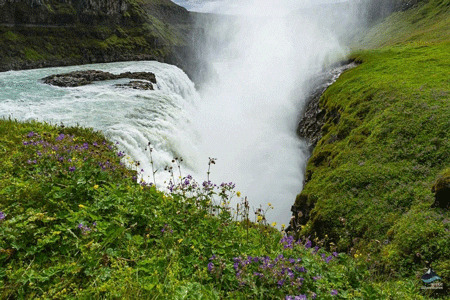 The final stop is the majestic Gullfoss Waterfall (golden falls), where water cascades down over two lava steps into the emerald valley beneath. 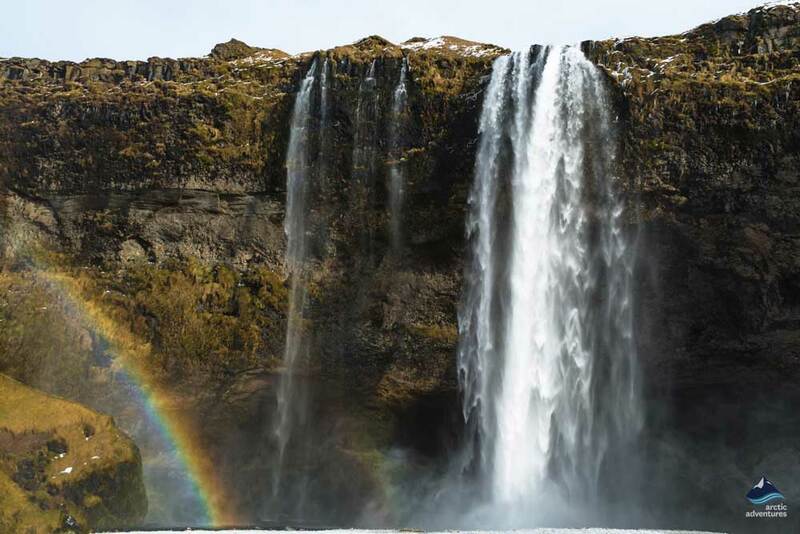 It is so named because the brown rocks beneath the falls cause the water to take on a golden hue as it passes over them, while rainbows commonly appear on sunny days, ensuring that it is the perfect way to really experience the regal majesty of mother nature. Once you have enjoyed all the magical sights that the Golden Circle has to offer, you will return to Reykjavik, for your final evening in Iceland’s bustling and modern capital. 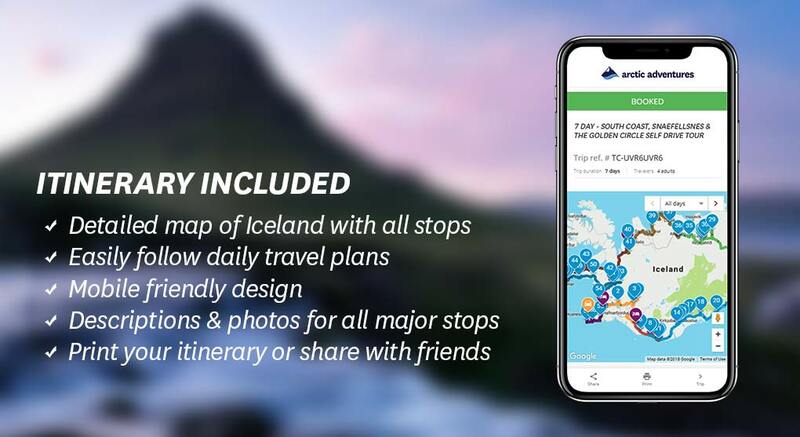 Day 4 is more relaxed and less organized than the previous three, with the scope of things that you can do largely dependent on the time of your flight, if it is early then you can head to the airport, while any extra time, is the perfect chance to explore all the incredible sights that Iceland’s modern capital has to offer. Locals love to spend their time at the tip of the Seltjarnarnes peninsula, renowned for its incredible range of birdlife and the iconic Grotta Lighthouse. There is a small hot spring nearby and we heartily recommend soaking your feet and taking in the spectacular view of the mighty Esja Mountain and the deep blue Atlantic Ocean. 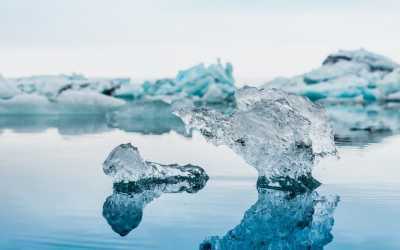 Another popular destination is the Reykjavík Botanical Gardens and Zoo, which are famous for the incredible range of flora and fauna, friendly seals, snow white arctic foxes and much, much more. Geothermal swimming pools abound in Reykjavik, meaning that they are cheap and easy to find: the ideal place to enjoy a natural soak in their warm waters. For those seeking the famous light show, which flickers across the Icelandic sky, otherwise known as the Northern Lights, then the best time to visit, is during the winter months between October and March. 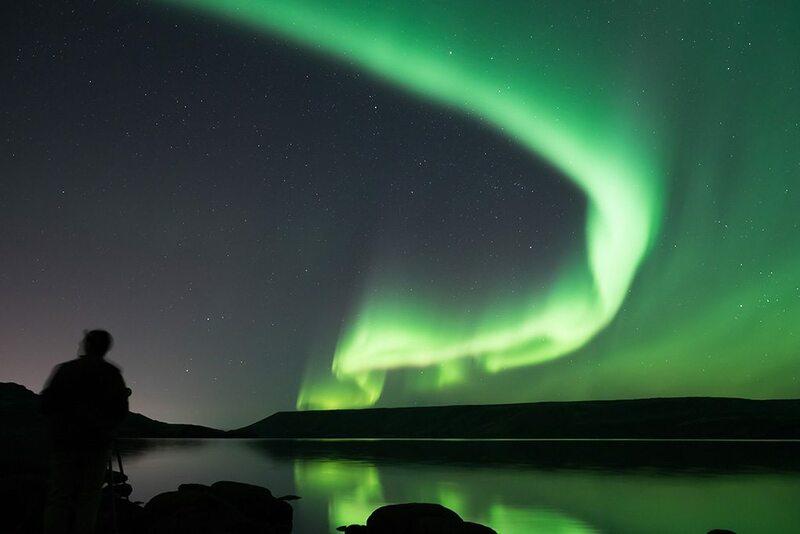 If you are lucky you might see them between late April and late August as well, although the Icelandic nights are often too bright, so despite the Northern Lights being there, it may not be possible to see them. Instead, you can enjoy the ‘Midnight Sun’, which means that the Icelandic night-sky is painted with the pinks, purples, and reds of sunrise and sunset, all night long. The trip ends when you drop your rental car with us at KEF airport and we bid you goodbye. 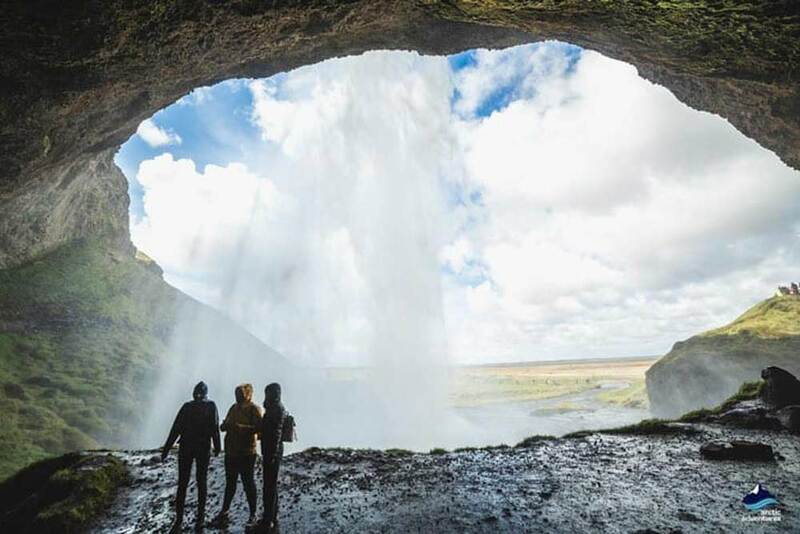 This trip is the ideal way to explore all the magic that the land of fire and ice has to offer: cascading waterfalls, mighty glaciers, bubbling geysers and a whole host of other things are just waiting for you to explore.